Levels 2 & Up. All Regions DVD. 90 minutes. 12 center exercises. Finis shows and explains each exercise, Saige Miller does it, Finis corrects and coaches, Saige does it again. When it’s needed, Finis has Saige try a step several times so that it’s very clear to the viewer (and Saige) what needs to be done. Besides the technical “how to” information, Finis gives examples of musical and artistic choices that make the difference. With each exercise, it becomes clear that as you learn and perfect your preparations, you’ll get the results you’re looking for. The centerwork proceeds from working on pirouettes at the barre through grand pirouettes en dedans to new jumps such as balloté, balloné, entrechat royale, grand fouetté en tournant, and grand jeté saut de chat. The CD music is by Scott Killian. “This video is an excellent learning experience as it will teach intermediate and advanced dancers all the hidden facets of what transforms a turn or jump into an exciting experience for the audience. The young demonstrator, Saige Miller, keeps on improving her execution throughout the video under Finis Jhung’s expert scrutiny and precise coaching. The video starts at the barre with practice of the pirouette en dehors and then moves on with more and more complex movements and combinations in the center that require frequent change of directions and balance. 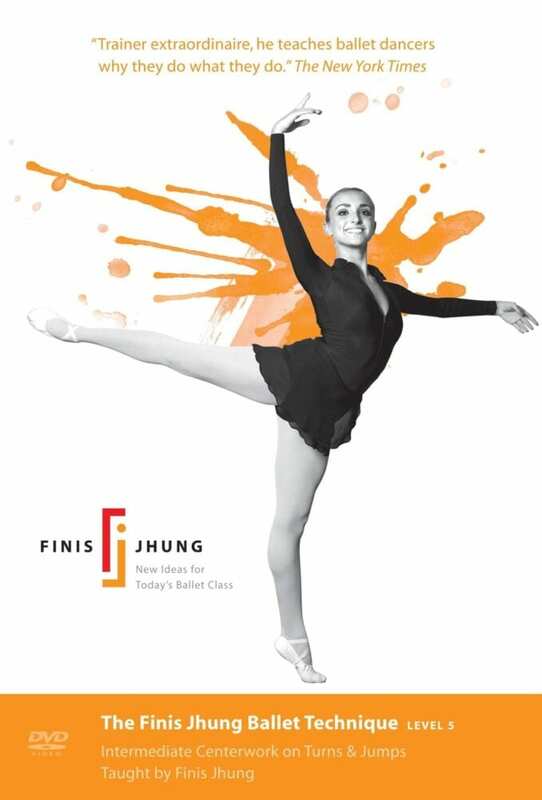 Finis divulges those little secrets to artistry that are not known by many dancers. For example, I was so grateful to hear how you can develop a winged foot in arabesque, something never explained to me before. Another very important aspect of this video is the focus on knowing and properly executing the preparations for both turns and jumps some of which are definitely more challenging for an older adult student like me — the ballotté, the balloné, or the grand pirouette en dedans and the grand fouette en tournant — but nonetheless it is wonderful to see how steps like these can be used in organic and beautifully danceable combinations. This video is a culmination of two earlier videos, Level 4 Turns and Level 4 Jumps, integrating and nuancing the knowledge and practice for both students and teachers, or people like me who, like many older adult students, are simply trying their best. What an invaluable resource! I strongly recommend all three videos in order to master both turns and jumps.